Hiya guys! 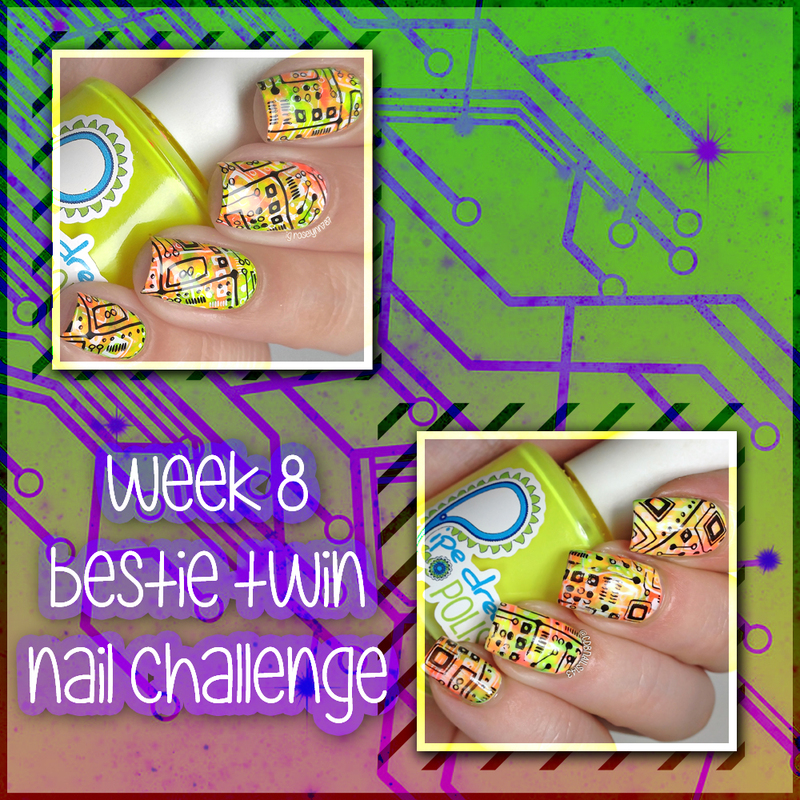 I'm kicking off some dust from one of my favorite segments the Bestie Twin Nail Challenge. For the last two months I've been doing these with Cheyenne of CDBNails on a bi-weekly basis, but then I ended up missing the last two. Although I did the manicures, I never got around to posting them because I just wasn't proud of the outcome. I know that's kind of silly considering I went through the effort of recording and editing... but... meh. I only want to post nail art I'm proud of especially when it comes to this challenge because it's so dear to me. But enough of that, here's my pick for week 6! Does this not look trippy as heck? 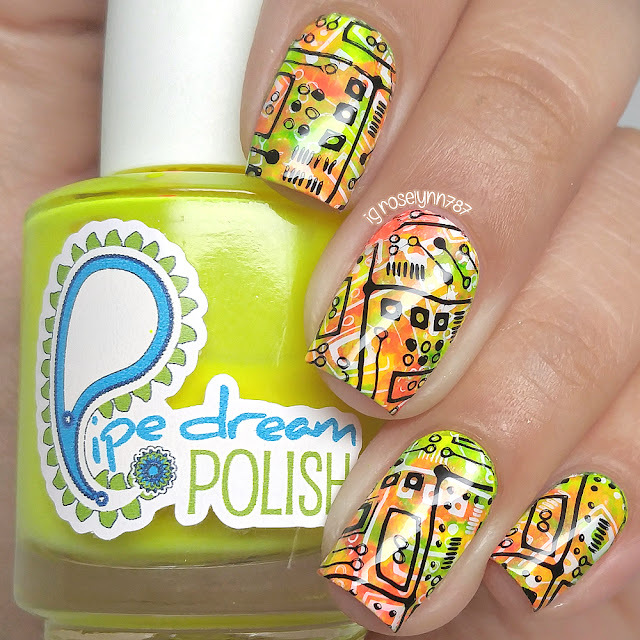 This is probably one of my favorite stamping plates from Winstonia that I own. I created a similar look a few years ago, though back then I did the stamping over a neon watermarble. But this time around I wanted to do something on the simpler side and so here we are. I know you guys are probably getting sick and tired of me using these neons. They're literally the only set I own that I know Cheyenne has as well so it makes coordinating colors so much easier. Besides it's summer time so it's like neon all the things season, haha. 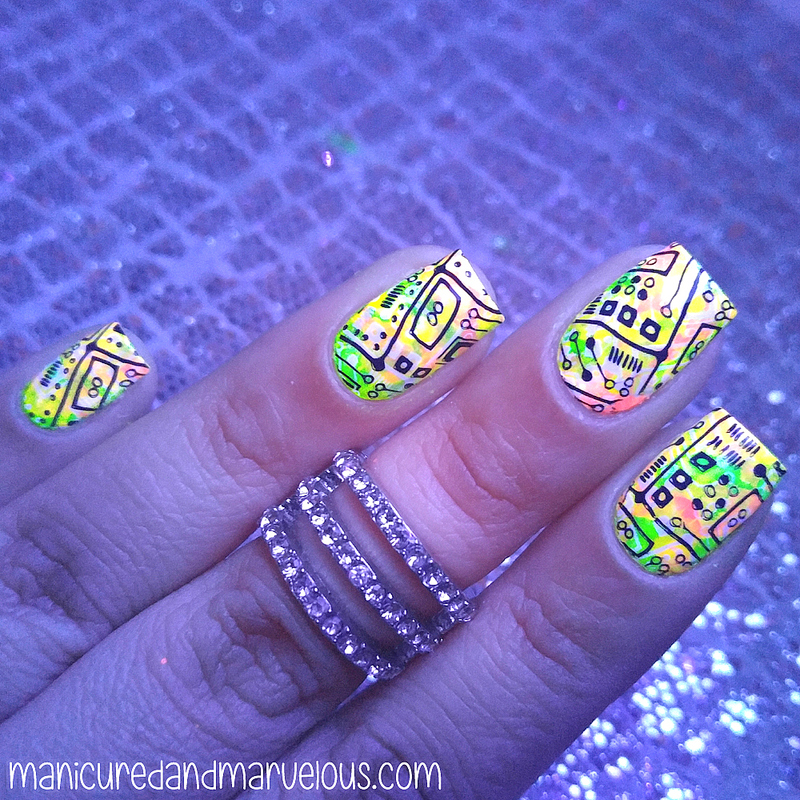 If you guys have some neon polishes you recommend please let me know down in the comments. One of the main things I wanted to accomplish with this design is quickness. If I didn't stamp, then this mani would have been done within a half hour easily. Stamping only ended up adding maybe another fifteen minutes so it was still under an hour. Pretty good for 'Snail Rose' if I do say so myself. Please be sure to check out my video tutorial down below and subscribe to my channel. I'm on the road to 1k subs and I am so excited. YouTube has seriously become my addiction! I love making videos for you guys, so I hope you stick around. I actually ended up forgetting to mention in my video tutorial a few things about the dabbing procedure. Some viewers had concern for the brushes getting messy by dabbing them over different polishes. There are one of two things you can do to make sure your brushes stay clean and only the color they're supposed to be in. First thing is to wait until the colors dry before going in for the next color to dab. Remember, you're only dabbing so it's minimal polish which will dry within a minute if that. The other thing you could do is to clean the brush on a paper before sticking it back into your bottle. Either way it's really easy to avoid messing up your polishes! And yes, this manicure is black-light reactive! I'm sorry the photo is a bit blurry, but with all that neon action my camera could not focus. I can't blame it though, I mean I can hardly focus on all that brightness! It really brings to life the whole circuit board feeling if nothing else. Ignore my error on the collage, I put week 8 instead of 6. Sigh. I actually didn't notice the whole day yesterday and even through editing I was completely oblivious until my friend pointed it out. Anyway hope you guys like this design, stay tuned for my makeup manis sometime next week. I definitely want to them done before the month is over because I may or may not have another segment with Cheyenne in the works! You'll have to stick around to find out! These turned out so fun! I'm going to have to check out your video when I get a moment. I love this look! I never get tired of neons! I love neons. 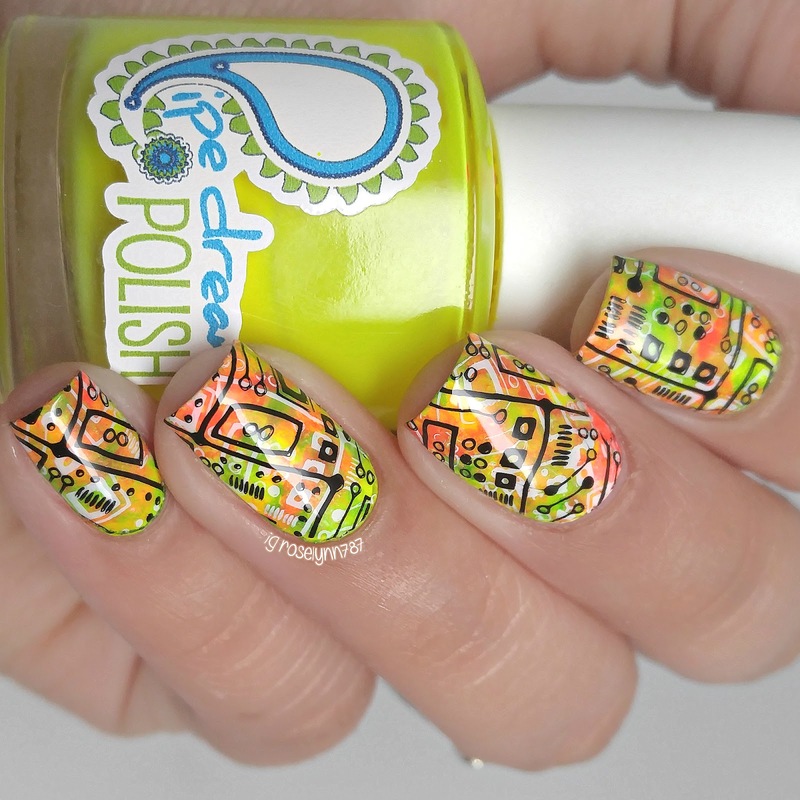 Very pretty mani.